Crisp and crunchy outside and soft and chewy inside, these cookies will take you right back to your childhood. While I was in Arizona on vacation, I finished up both of the books that I brought with me. My friend, Linda, with whom we were staying suggested I read Crimes against a Book Club by Kathy Cooperman. I finished it on the flight home. This is a fun, easy read. It is about Annie, who's husband insists on moving into a hoity toity La Jolla neighborhood. Annie feels very out of place but tries to fit in. She joins a book club to find that nobody really reads the books, rather they sit around tearing people apart and trying to outdo each other with their latest, outlandish purchases. Annie is stunned at their shallowness and extravagance. Meet Sarah, Annie's best friend, who is a high powered attorney married to an archeologist. She works horrendous hours, he is barely home and they are having no success in starting a family. Sarah is undergoing IVF treatments at a great cost, not only financially, but physically and emotionally. It is wreaking havoc on her marriage, her career and her relationships. Things finally come to a head and Sarah quits her job. That relieves one stress but adds the stress of the financial burden of continuing with the IVF. During this period, Annie's son is diagnosed with autism and requires a huge amount of therapy and treatment. Annie had no idea where they were going to get the money. 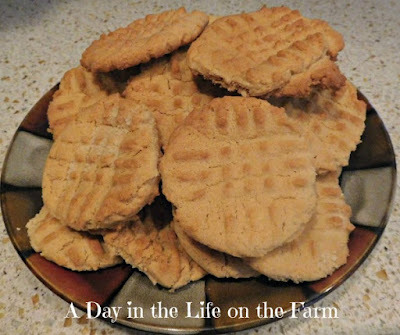 One of the great things about this recipe that I started baking with my mother when I was little, continued to bake with my children when they were little and now bake with my granddaughter is that it is so easy peasy. Most of the ingredients require a half cup or a half teaspoon. The only change to this is one egg and one and a quarter cup flour. It is one of those recipes that you never need to look at again once you learn it. Bake yourself these cookies. Pour a cup of coffee. Grab this book and curl up by the fire and lose yourself for a few hours of lighthearted fantasy. 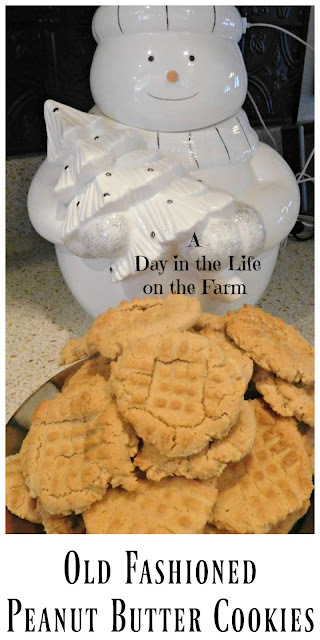 I am sharing this book over at Foodies Read. Stop by and see what the others are reading this month. Cream the butter, peanut butter and both sugars together until light and fluffy. Mix in the baking soda, baking powder, vanilla and egg. Turn the mixer to low speed and gradually add the flour until completely incorporated. Using a cookie scoop, place onto a baking sheet that has been covered with parchment paper or lined with a silicone mat. Using a fork, that has been dipped in flour or sugar, flatten the cookie by making a criss cross pattern on the top. Bake in a preheated 375* oven for about 9 minutes, until lightly golden brown. These cookies look delicious. I wish I had one! Thanks, I wish I could share with you. Let me know what you think Claudia, and I'll let you know after I try your version. Yes, this is a different book not the one on which the movie is based. It is a fun read though and I think you would enjoy it. The movie was a lot of fun this month too. Can't wait for roundup.